FiveJoy Kids Spaceship Teepee is awesome! I love that it's made of cotton so it's breathable and doesn't get too hot inside when the kiddos are playing inside. It also has two mesh windows so kids can lookout. The mesh windows are also nice to keep it nice and cool inside. The Velcro strap keeps the door closed so kids can blast off to outer space for hours and exit easily when they're ready to return. I also love that the material seems to be pretty durable so it should last for years to come. 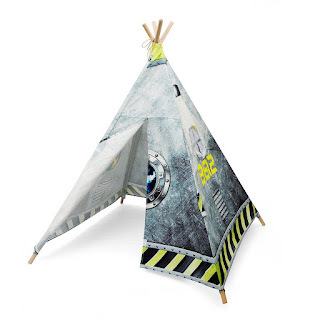 FiveJoy Kids Spaceship Teepee is the perfect toy for kids to excite their imagination!